The Monster Hunter 3 Ultimate Data Transfer Program can be downloaded for free from Nintendo eShop on Nintendo 3DS, and requires an SD Card with 87 blocks of free space. It doesn’t matter if you originally started your game on Wii U or on Nintendo 3DS – you can perform the initial transfer in either direction. 1. On Nintendo 3DS, start the Monster Hunter 3 Ultimate Data Transfer Program. 2. 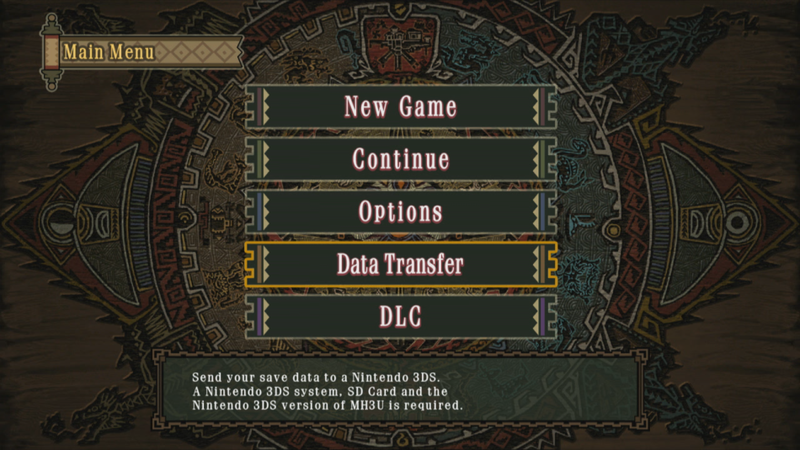 On Wii U, launch Monster Hunter 3 Ultimate and select “Data Transfer” from the Main Menu. 3. On Nintendo 3DS, select “Transfer Save Data”. 4. On Nintendo 3DS, select the direction you’d like to transfer save data: Nintendo 3DS to Wii U, or Wii U to Nintendo 3DS. 5. The Monster Hunter 3 Ultimate Data Transfer Program will search for your Wii U console. Select your Wii U console and data transfer will commence. 6. Once the data has been transferred, the Monster Hunter 3 Ultimate Data Transfer Program will close. Select Continue from the game’s Main Menu to load your save file and continue playing. When transferring save data from a Nintendo 3DS system to a Wii U using this program, it’s possible to create a backup of the data you’re transferring. From the options menu within the Monster Hunter 3 Ultimate Data Transfer Program you can create a backup of save data or recover save data from a previous backup. Please be aware that this backup data is stored within the Monster Hunter 3 Ultimate Data Transfer Program itself. Should you choose to delete this software, the backup save data will be lost. Only one backup save data can be stored at any one time. If you create a new backup, it will overwrite the previous data. To transfer received Guild Cards and downloaded content data from Wii U to Nintendo 3DS, you'll need an SD Card with at least 18 blocks of free space in the target Nintendo 3DS system you’re transferring to. You won’t be able to transfer save data from a Wii U to a version of the game on Nintendo 3DS that already contains save data. Before transferring save data, please erase any existing data. You can do this by going to the Options screen in Monster Hunter 3 Ultimate on Nintendo 3DS and holding the L Button, R Button and X Button simultaneously for three seconds. Please note that save data can’t be recovered after deletion, so only delete your data if you’re certain you won’t need it in future. After save data has been transferred from Wii U to Nintendo 3DS, the save file on Wii U will be temporarily locked, preventing you from progressing in the game using this save file. Once you have transferred your save data back from Nintendo 3DS to Wii U, you will be able to continue playing your save file on Wii U. To transfer from Nintendo 3DS to Wii U, you will need at least 12 MB of free storage on the Wii U console you’re transferring to. If you have save data on your Wii U that isn’t correctly linked to the save data on the Nintendo 3DS system you’re transferring from, you won’t be able to transfer your data between the two consoles. If you still wish to go ahead with the transfer, you’ll need to erase the save data from your Wii U. You can do this by going to the Options screen in Monster Hunter 3 Ultimate on Wii U and holding the L Button, R Button and X Button simultaneously for three seconds. Please note that save data can’t be recovered after deletion, so only delete your data if you’re certain you won’t need it in future. After save data has been transferred from Nintendo 3DS to Wii U, the save file on Nintendo 3DS will be deleted. Once you have transferred your save data back from Wii U to Nintendo 3DS, you will be able to continue playing your save file on Nintendo 3DS. The first time you start the game on Nintendo 3DS, you will be asked to create additional data on the SD Card. This data allows you to store Guild Cards you receive via StreetPass, and downloadable content data. If this additional data is later erased, the next time you launch the game you’ll be asked to create new additional data. After this new additional data has been created, load up your save data and save the game from your in-game bed, or by pressing START and selecting Quit Game, then answering “Yes” when asked if you want to save. If you have more than one save data file, please repeat this process for each file. If you do not save your game after new additional data has been created, it’s possible the Monster Hunter 3 Ultimate Data Transfer Program won't work properly in future.